The evidence for the radiation of modern humanity throughout Eurasia around 60,000 years ago was generally indicated by occasional occurrences. Most famously we had a fossil l group from Australia in that age window. Thus the evidence search is generally an effort to now fill in the blanks. I also want to observe that South East Asia was also tropical and generally above water. It was separated from the then much larger Australian Continent by a narrow water barrier which was no barrier to even a simple dug out canoe. Thus the combination of lands provided a huge homeland equivalent to Africa itself. Most of the human population surely lived in the lowlands in country similar to the present Amazon. Thus any evidence was long lost to inundation. As is true today scant populations operated in the highlands and there left us mortal remains. In fact I have long suspected that this has caused serious self selection of the data we have acquired. Since I have also conjectured a first rise of mankind on those same plains, I have effectively a whole world in which to hide billions should I have too. 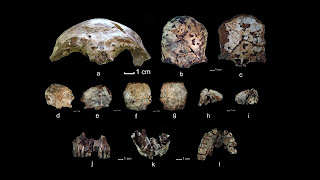 An ancient skull found in a cave in the Annamite Mountains in northern Laos has revised our conceptions of when humans first occupied Southeast Asia and Australia. 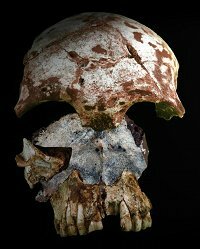 The skull, which is the oldest modern human fossil ever discovered in that part of the world, shows that ancient humans inhabited diverse habitats far earlier than previously indicated by the fossil record — and that migration into Asia occurred at a relatively rapid rate. The study was led by University of Illinois anthropologist Laura Shackelford, who, along with anthropologist Fabrice Demeter from the National Museum of Natural History in Paris, were the first to look for ancient bones in Laos since the early 1900s. Back then, a team found human remnants in another cave which were dated at about 16,000 years old — considerably younger than the newly found skull which is estimated to be between 46,000 and 63,000 years old. To establish the time frame, Shackelford and Demeter used radiocarbon dating and luminescence techniques to determine the age of the soil layers above the remains. The skull itself was found about eight feet below the cave's surface. The skull fragments were reasonably well preserved, allowing the anthropologists to determine that it belonged to a modern human. No artifacts were found along side the skull, an indication that the cave was not likely a dwelling or burial site. Shackelford and Demeter theorize that the ancient human died outside, and that the body washed into the cave at some later point. As far as the anthropological canon is concerned, the discovery strongly suggests that early modern humans who left Africa did not simply migrate along the coast and go south to the islands of Southeast Asia and Australia. Rather, they ventured north into very different types of terrain. Speaking to io9, Shackelford told us that she never actually expected to find fossils. "This discovery suggests that modern humans followed multiple migratory paths once they arrived in Southeast Asia," she said. 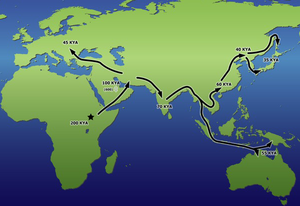 "Traditionally, we have assumed that they followed coastal routes towards island Southeast Asia and Australia, but this very early modern human was using an inland, mountainous route. Shackelford noted that the Tam Pa Ling fossil has clear implications for modern human origins broadly and for the earliest migrations into Southeast Asia. "It supports an Out-of-Africa model for modern human origins and not a multiregional hypothesis because the anatomy is clearly modern and without features that are typical of local, archaic populations," she told io9. "Given its early date, it also suggests that the migration out of Africa occurred relatively quickly — genetic data indicates that the earliest migration of modern humans into Southeast Asia occurred at least 60,000 years ago." Tam Pa Ling is the first fossil data that coincides with this genetic data. In terms of next steps, Shackelford noted that her team, which is composed of researchers from four countries, will continue to excavate at Tam Pa Ling. "This is one of thousands of caves in the Hua Pan Province so our future work also includes surveying the surrounding area to find additional areas of human occupation." The study will appear in an upcoming issue of the Proceedings of the National Academy of Sciences. All images via Laura Shackelford, University of Illinois at Urbana-Champaign.